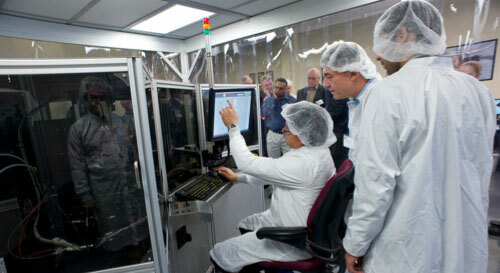 (Nanowerk News) University leaders and nanotechnology researchers joined representatives from industry and government agencies on Wednesday at Northeastern’s George J. Kostas Research Institute for Homeland Security to unveil NanoOPS, a nanoscale printing system with the potential to transform nanomanufacturing and spur innovation in a range of areas including electronics, medicine, and energy storage. Researchers worked with the state-of-the-art nanomanufacturing instrumentation. NanoOPS, short for Nanoscale Offset Printing System, is housed at the Kostas Research Institute in Burlington, Massachusetts. The state-of-the-art system is the result of a strong academia-industry-government partnership—NanoOPS’ design is based on innovations and patents developed at Northeastern’s National Science Foundation-funded Center for High-rate Nanomanufacturing; Milara, a Massachusetts-based manufacturer of specialized equipment for the semiconductor industry, built the system; and public agencies, such as the National Science Foundation and the Massachusetts Technology Collaborative, supported the research and development. Researchers said NanoOPS will operate at a fraction of the cost and time as current nanofabrication methods, which will make nanomanufacturing accessible to more innovators and entrepreneurs. The system blends traditional offset-type printing technologies with state-of-the-art technologies at the nanoscale to make products that leverage nanomaterials’ superior properties. In only a matter of minutes, the system can print metals, organic and inorganic materials, polymers, and nanoscale structures and circuits onto flexible and inflexible substrates. The new system incorporates patented technologies developed by Northeastern graduate students, postdocs, and faculty researchers, moving society closer to a world with nanoscale devices for a vast amount of applications, such as new and affordable medicines; stronger and lighter building materials; and faster, cheaper electronics. Throughout Wednesday’s ceremony, speakers emphasized that it is the partnership between academia, industry, and government that have made these efforts possible. “What we’re seeing today are the fruits of collaboration,” said Ahmed Busnaina, CHN’s director and the William Lincoln Smith and Professor in the College of Engineering. He said NanoOPS will now present many new opportunities to collaborate with companies interested in leveraging this technology. Busnaina also praised George J. Kostas, E’43, for his longtime support; prior to establishing the homeland security research center in Burlington, Kostas invested $2 million to found the George J. Kostas Nanoscale Technology and Manufacturing Research Center. Industry-academic partnerships were an integral part of Kostas’ vision for the Kostas Research Institute when he began discussions with President Joseph E. Aoun several years ago. The institute, which officially opened in 2011, would go beyond advancing security science and research—it would also enable industry-academic partnerships. That vision came to fruition in March with the opening of the Rogers Corporation Innovation Center, which aims to advance basic research and develop commercially viable breakthrough innovations in advanced materials to address global challenges in clean energy, Internet connectivity, safety, and security. Wednesday’s unveiling of NanoOPS is the continuation of that vision. Kostas said he was very proud to see the remarkable progress made by Busnaina and his CHN research team, which he said exemplifies Northeastern’s leading research efforts to translate that work into societal benefits. “These partnerships are the best means to accelerate the development of new technologies for a positive impact on the world,” he said.